INDUSTRY-LEADING AD/DA With its phenomenal 136dB of dynamic range (measured at Monitor Outputs), Orion 32HD | Gen 3 offers the industry's finest AD/DA conversion. 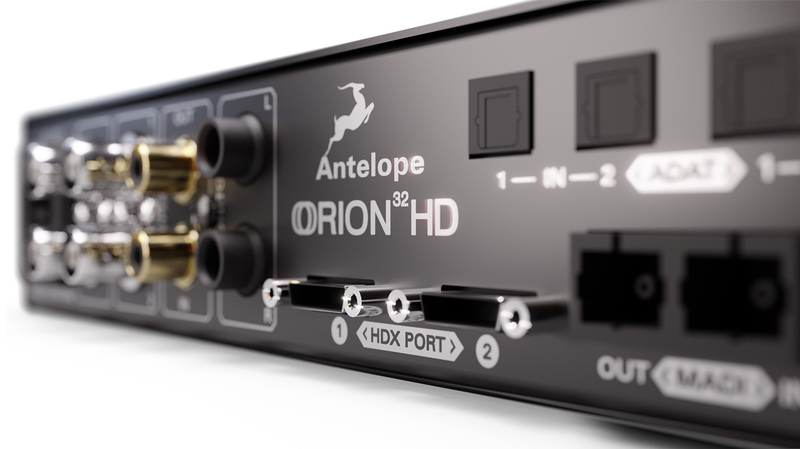 LOW LATENCY OVER HDX With HD, HDX & HD Native connectivity, Orion 32HD | Gen 3 achieves low latency and compatibility with HD systems. FLAWLESS CLOCKING Hear the true sound of music with Antelope Audio's next-generation 64-bit Acoustically Focused Clocking technology & jitter management algorithm. REAL-TIME EFFECTS A rich collection of circuit-level gear emulations, running in real-time on an integrated FPGA FX platform. FLEXIBLE WORKFLOW Use the Orion 32HD | Gen 3's intuitive software control panel from multiple computers connected over the same network. EXTENSIVE CONNECTIVITY Stream 64 channels of hi-res audio over HDX or USB 3.0; connect digitally over MADI, ADAT, and S/PDIF.